Let’s Have A Conference Call, Folks! Singapore. Canada. California. New York. And, to ice the cake, Bangalore. The conference call was scheduled to start at 9:30 in the morning, and at 9:29, I realized that the phone in the corner did not have an international calling facility. I was sitting there, all prepared, my papers spread out in front of me, my pen handy, my head going over the different methods of opening the conversation, saying “Hi” or “Hello” or “Good morning”, and then, I sat there listening to the sweet yet hideous female voice telling me that this service isn’t available on this phone. I wondered what to do. The clock ticked away the seconds of the one minute left for me to sign into the call. I gulped and took a decision that I knew I’d regret. I flipped open my mobile and punched in the numbers. I prayed hard, hoping the call would end in a few minutes. It didn’t. It lasted for an hour and fifty minutes. I sighed and resigned myself for a fat bill this month. Conference calls, according to me, are a supreme waste of time. I think more work can be accomplished through an email. The first twenty minutes are obviously spent in introducing all the people in the call. The next thirty-odd minutes go away in outlining the agenda for the conference call. The remaining hour or so is spent in asking people to speak up; apologizing for loud cell phones; apologizing for the rackets behind their respective backs; and finally, asking everyone present if they understood the last point. More often than not, there will be at least three jerks who would not have paid attention, and they would ask you to repeat the last point. The frustrating thing about these conference calls is that you cannot abuse anyone verbally. If the same meeting is held over emails, then before sending each and every email, you can let out the wonderful stream of expletives, and feel good about yourself and the other person’s lack of knowledge. You can question his/her ability to think straight, his/her man-/womanhood, his/her ridiculous name, and lot of other things. But on a conference call, you have to hold your tongue and treat even the most outrageous of jerks with an amount of respect. It takes so much out of you. You can’t even make fun of funny names! Anyway, I have had too many conference calls till now. I think I’ve devised a formula to survive each one of them. I call it “Apparent Indifference” – if you give the impression to the other jerks on the call that you’re indifferent about the outcome, then they’ll fall over themselves to spell out each and ever point of concern and make sure that each and every doubt has been answered. This, of course, helps me in making the meeting a success. Whatever size, form or shape, toilet humor has always brought a smile to people’s faces. So, even if someone does not like the idea of a whole post on Farting Etiquette, what the fart? I’ll still write it. Mankind I have always harbored an admiration for the powerful forces of nature. Wind energy is the next best thing to fossil fuels, and as long as there’s food on the planet, there will be farts. 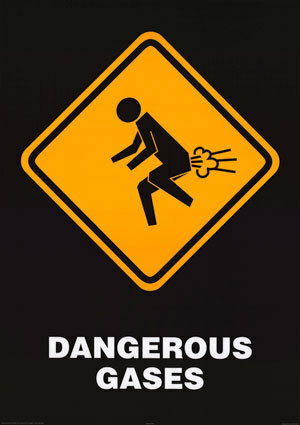 Breaking wind is an essential fart of human nature. The fart of the matter is, no one can hold it any longer than 2 hours. This is scientifically proven at the MirrorCracked labs. There are certain etiquettes when it comes to unleashing our wind upon the unsuspecting public, and not many people adhere to it. If in a meeting with 4 or more people and you very quietly let loose, then slowly start pushing your chair away from the person sitting next to you and give him/her a dirty look. Others will follow suit. This technique is called Farting The Blame. If you’re with a girlfriend/boyfriend and you realize that you have to break wind, then play some music and tell your partner that you’ll dance for her/him. Unleash the wind energy quietly while dancing. He/she will never know. It’s easier for smokers – they can just light up to kill the stink. If you’re with someone who’s irritating you and you just want them to go away, then do the sonic-boom.